Oh, Kiehl's. How on earth do you keep making products that are so darned FABULOUS all the time? Somehow, every product you create is better than the last. And, par for the course, such is the case with your two newest products: Kiehl's Super Multi-Corrective Eye-Opening Serum and Kiehl's Calendula Deep Cleaning Foaming Face Wash.
Let's start with the Calendula Deep Cleaning Foaming Face Wash. It's formulated with -- you guessed it -- calendula, which is extracted as an oil from the marigold flower. (Side note: I LOVE marigolds. I've loved them ever since I was in elementary school and we had to plant them during art class.) Calendula works to soothe all oily skin types, including sensitive and delicate skin. This face wash also contains plant-based glycerin, which pulls essential moisture into the skin. To use, you simply wet your face, pump the cleanser into your hands, work it into a lather and then massage into your skin. I've found that three pumps is more than ample to completely cover your face and leave it feeling fresh and clean. The formula is non-drying and it smells divine. 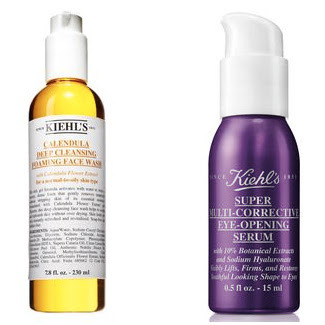 And then there's the Super Multi-Corrective Eye-Opening Serum. I'm already obsessed with the Super Multi-Corrective Cream, so I don't really think it's too surprising that this serum has worked its way into my heart, too. A combination of Sodium Hyaluronate (the sodium salt of hyaluronic acid), botanical extracts and skin illuminating minerals moisturize, emulsify, lubricate and firm the skin while also diminishing under-eye darkness, minimizing the appearance of wrinkles and improving skin luminosity. I started noticing results the very first day I used this serum ... and only one pump of the shimmering white fluid is enough to use on both eyes! And here's the best part. One lucky winner has the chance to receive both of these products today! This giveaway has a retail value of $77. To enter, use the Rafflecopter widget below. Good luck! One product I never leave out is sunscreen! After cleansing I always put on moisturizer with SPF before putting on anything else. I always use a cleanser to wash my face - right now I have a Lancome one that I love. I make sure to wear sunscreen in my lotion every day!! I hope I win this one I have wanted to try kiehl's products for a long time! I always try to use a moisturizer with sunscreen. Moisturizer! I MUST have a moisturizer. My dry skin gets very upset with me if I'm in a rush and don't use it. I always include moisturizer (in the form of essential oils or creams) in my daily makeup routine! Taking care of your skin by keeping it quenched is so important! I always include eye cream in my regimen. Every morning I put on spf-containing moisturizing + mattifying lotion. A moisturizer with sunblock in it. I live in NYC and spend a good deal of time walking outside on my commute so it's critical that I use it every day! Aquaphor every night on my lips before bed! I never ever leave the house without sunscreen! I also have been using Organic cold-pressed Rosehip oil for almost a year now and it's done wonders for my mature skin. I enjoy toners and always include this step in my routine. A good toner is so important to my skincare routine! -Emi P.
I use baby sunscreen all of the time. I may be pale, but I don't have wrinkles! Never forget the moisturizer. Even if it's an oily kind of day. I have a Mario Badescu face wash that I have used forever and I love it still. I always must have my sunscreen included in my skincare routine. Never leave the house without it on. I always include sunscreen and moisturizer. I've never really used an eye cream...perhaps I should start?